For the third time in a row, the Indian Institute of Science, Bangalore (IISc) has ranked as the best university in India. Second is JNU, followed by the Banaras Hindu University (BHU) in the National Institutional Ranking Framework (NIRF) of the Ministry of Human Resource Development (MHRD). The rankings were released by the Union Human Resource Development Minister Prakash Javadekar on Tuesday, April 3. Among colleges, Delhi University’s Miranda House too has retained its first position while St Stephen’s is at number 2. The third position is bagged by Bishop Heber College. Hindu College, Delhi, Presidency College, Chennai, Loyola College, Chennai, Shri Ram College of Commerce, Delhi, Lady Shri Ram College for Women, New Delhi, Ramakrishna Mission Vidyamandira, Howrah, Madras Christian College, Chennai were the rest in top ten, in that order. The top three engineering institutes which figure in the list are IIT Madras, IIT Bombay and IIT Calcutta. In the management category, like last year, IIM-Ahmedabad has retained its top position followed by IIM-Bangalore and IIM-Calcutta. Overall IISc, second time in a row, has been adjudged the best higher educational institute followed by IIT Madras and IIT Bombay. Under the law category, NLU Bangalore is number 1 followed by NLU Delhi and NLUSAR. In the architecture category, IIT Kharagpur is at top position while IIT Roorkee and SPA Delhi at number 2 and 3. This year, the government has come out with nine categories – adding law, architecture and medical in the existing list of universities, engineering colleges, pharmacy and best colleges, said a report in The Indian Express. 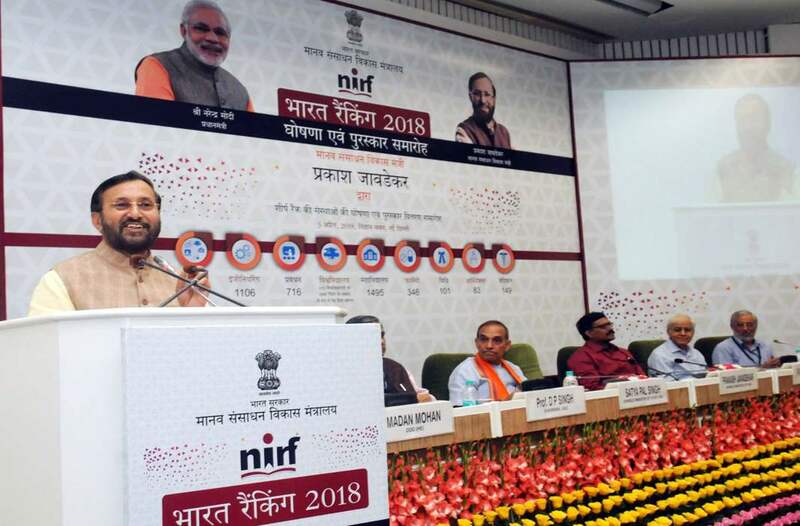 Using the same broad parameters, NIRF has added several new criteria such as total budget and its utilisation, combined metric for quality of publications, university examinations and how many graduating students admitted into top institutions. HRD Higher Education secretary R Subrahmanyan said public institutions which do not participate in national ranking will face fund cut. The number of institutions participating in the rankings have risen by over 1,000 this year, said a Times of India report. According National Board of Accreditation sources apart from the government institutions, a large number of private higher education institutions have joined the rankings this year who were not part of the process earlier. In NIRF, to promote research and development in the higher education, ‘Research and Professional Practices’ has been given the highest weightage of 40 per cent for ranking Universities. In a statement at the Lok Sabha on Monday, Minister of state Satya Pal Singh said ranking promotes competition among the Universities and drive them to strive for excellence. Government has also started a scheme called ‘Institutions of Eminence’ in which 20 institutions both public and private, would be selected on challenge method and they would be actively supported to come up in the global rankings.